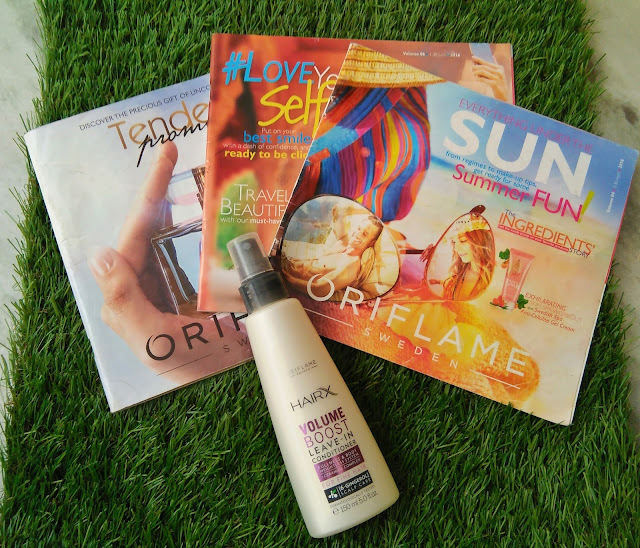 Being a Skin and Hair-care enthusiast, I was searching for products within the Oriflame catalogue which would make my skin and hair both happy and healthy. While scrolling through the pages, I read "BECAUSE BIG, BEAUTIFUL & BOUNCY IS ALWAYS ON TREND". I couldn't agree more to it and came across the range called HairX which has a plenty of hair care products. Having fine, thin hair (thanks to my hormones), I keep on hunting and craving for products and homemade remedies/ DIYs which would make them look thicker and voluminous. When I saw HairX Volume Boost Shampoo and Conditioner, I knew I had to grab it asap! 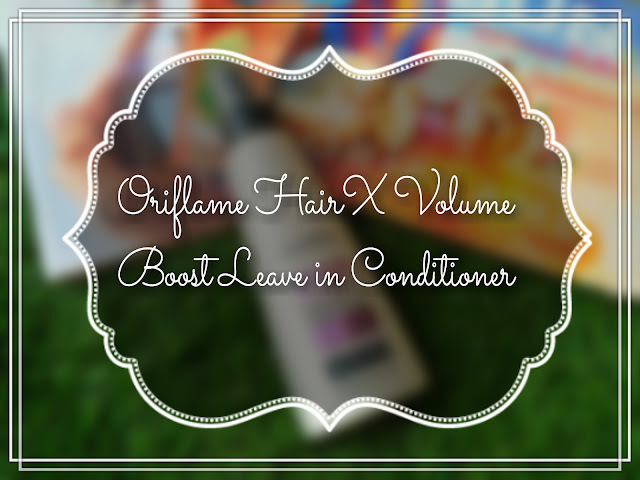 I had never tried a leave-in-conditioner and this one claims to detangle and give hair an instant volume. The Hair X range is based on a unique scientific system combined with carefully selected ingredients to target your specific hair needs. Read more onto their official website here. 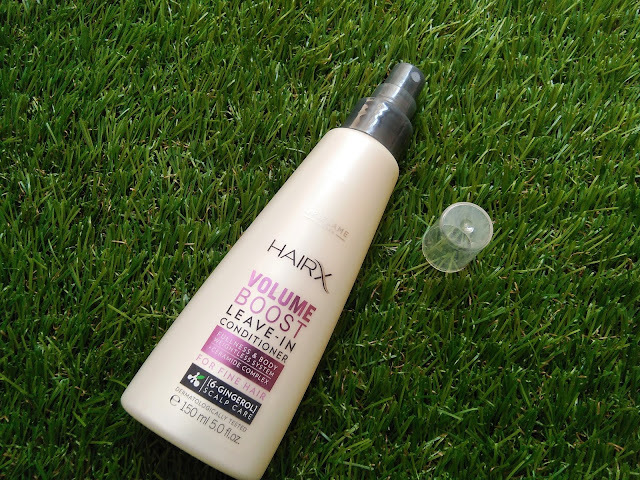 Product Description: Give fine hair fullness and volume. 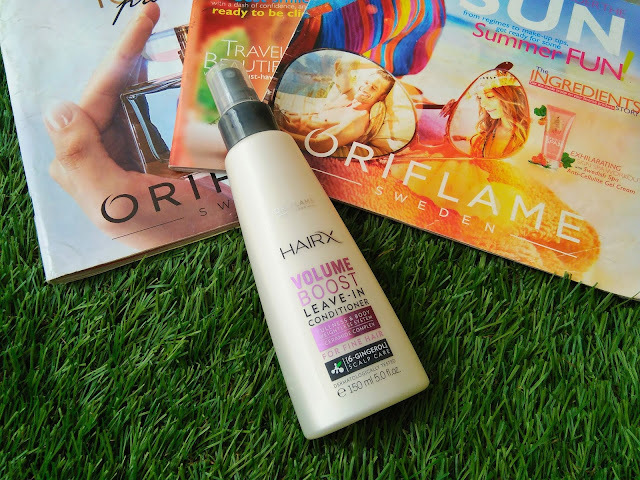 This light leave-in conditioner spray provides weight-free conditioning to control, manage and condition limp and flyaway hair. Oriflame Catalogue Claims: A leave-in conditioner that helps manage hair while effectively boosting volume. A weightless formula with Ceramide Complex to inject hair with bounce and body, while helping to detangle and control hair. For fuss free healthy hair, spray on wet or damp hair. Work the conditioner through your hair paying special attention to the tips. Do not rinse. ▶Anti-static agent (Polyquaternium-4): helps to keep your hair under control and prevent static and flyaway hairs. ▶Wax free combination of conditioners (PEG12 dimethicone): doesn't flatten the hair keeping it feeling soft while lifted and full of vitality. ▶6-Gingerol (Zingiber Offocinale) is a bioactive compound found in Ginger. It offers extraordinary anti-oxidant, soothing and purifying benefits that help to protect the scalp. Availability: Buy online from HERE and HERE. Packaging: I must say I was really impressed with the packaging of this conditioner. It comes in an off-white, glossy plastic, spray bottle which is really light weight and has a tapered shape; narrow at the top, it gets broader towards the bottom. The product is leak proof and travel friendly. There is enough product in one spritz and the bottle is really handy. Consistency: Unlike pack conditioners which are heavy and thick, the consistency of leave in conditioners is thinner and less viscous. This conditioner also has a liquid-like non sticky consistency. When this conditioner arrived, I was really keen to try it out. I wanted to go straight in to the shower and get the volume I always crave for without even checking all other products. The idea of leave-in-conditioner really intrigued me and as impatient as a hungry kid, I rushed in to the shower and used it on my hair. I couldn't wait to wash my hair with a shampoo as I was so eager to use it. I had really high expectations with this product. My hair are generally very soft and shiny even without using conditioners. One thing I just don't have but this conditioner claims is "Boosted Volume". Each second in the shower seemed as long as eternity and finally the conditioning part came. I fell in love with the juicy sweet frangrance it has but that was not something I would prioritise the most even though it matters a lot. My expectations and excitement suppresed all of a sudden when I started to realise that my hair were not actually getting detangled as they're supposed to. I waited for my hair to get air dried and once it finally happened, I got highly disappointed. A conditioner, especially a leave in conditioner should prevent hair from becoming frizzy in the first place but this one rather made my hair frizzier. My hair which would generally look soft and manageable unanticipatedly became a big mess and a mass of frizz. Instead of nourishing, hydrating and detangling, it made my hair look damaged, frizzy and life-less all of a sudden. My hair would feel better without a conditioner rather than applying this one. I got extremely worried if it would always remain the same because the horror you get when an unexpected and bad change occurs is terrifying. I wouldn't do injustice to my lovely soft hair strands again by using this conditioner. If this product means to add more frizz to hair, then I doubt if I do not know the correct meaning of hair volume. No, definitely not. It is a really expensive product according to me because it does nothing and charges us a lot. How can I? I regret buying this product and would never ever suggest anybody to give it a try. Final Verdict: Not worth buying at all..
Zeba Noor, is a blogger at Hearty Diaries. She is a Skin & Hair care enthusiast but that doesn't make her love for makeup any less either! She shares her opinions about makeup and beauty products along with DIYs, tips and tricks and natural home remedies. #Pictures clicked by Zeba Noor & editing done by Team of Think It Over. Great Bhawna! You're pretty humble to help out upcoming newbie bloggers. Hope I'll get the chance to write some posts on your blog as well. Thanks for sharing this review Zeba.. It's a really great help for anyone before buying a product. Sorry it was such a bad experience.